The smooth functioning of your home or business is not dependent on one single thing. An almost overwhelming system of smaller things drastically affect the condition of your property. While you manage everything under your roof, our Gorillas can take care of everything on top of it. Every property around the St. Albert area has a distinct look, feeling and character. At a street view, you can tell a lot about a property from the outside, so don’t let something as simple as a cluttered or moss covered roof say the wrong thing! 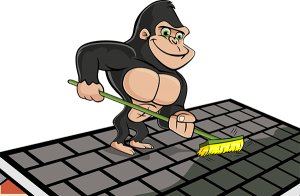 At Gorilla Property Services, our trained staff are ready to take on your St. Albert Roof Cleaning and moss removal and get your property looking its best. Ordinarily, there is a distinct difference in appearance between standard commercial and residential properties throughout the St. Albert area, each with different challenges from a property maintenance perspective. Far from leaving St. Albert residents in the lurch, our local technicians are only a phone call away. Having the peaked roof of a residential space can make moss growth and clutter easier to see, but that does not mean that it is not present in the flatter business properties as well. Having organic debris or clutter on the surface of your roof may not seem like a big deal, your roof is supposed to protect against the outdoor elements, right? But without proper maintenance, these elements can find their way in! Retained moisture in the organic material can sit underneath the shingles on your roof, dampening the materials underneath and making room for moss to spread, pulling up the shingles themselves and damaging your roofs moisture barrier. Far from showing up to your property with a wire-brush and some elbow grease, our Gorillas know how to treat your property right. Call today to speak with one of our highly trained Gorillas and find out what our St. Albert Roof Cleaning and moss removal can do for you.